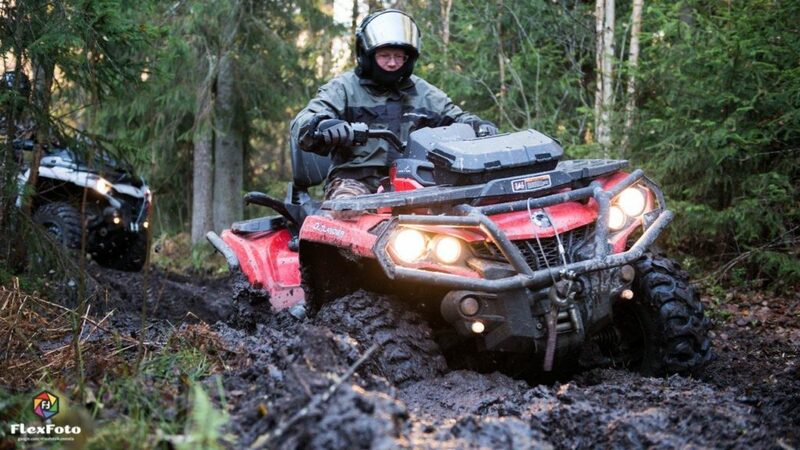 ‘Pois Tieltä!’ quad safari offers companies driving experiences year-round in a varying terrain: in the forest, fields and even some village roads. Quad safaris are driven with agile and state-of-the-art Can-Am and Arctic Cat quads. You don’t need any previous experience to drive a quad. Quad safari always includes guidance and orientation to safe driving. Organise a memorable event for your clients or staff. A business event can even include sauna, dining and meeting services. Our experienced trainers will help everyone to get started, so that clients get to experience the thrills of off-road driving. Interesting and various terrains make the quad safari just challenging enough both for the driver and the vehicle. The route conditions change when the safari moves from steep cliffs to wet marsh or from the forest to a meadow. The altitude change is 50 metres at most. Changes in seasons and weather conditions bring their own challenge to the quad safari. Snow, ice, damp or mud won’t stop a safari but make the driving interesting. You prepare yourself for a quad safari with a driving suit and a helmet. ‘Pois Tieltä!’ will provide the appropriate gear for the duration of the safari! Before the drive, we go through the vehicle, land rover, quad or enduro driving techniques and safety matters. At the same time, we’ll go through the vehicle’s controls. We will be using these to keep contact with the instructor and other team members during the drive. All our personnel has completed Mönkkärit ry safe driving training. ‘Pois Tieltä!’ is an official Can-Am trainer! We will get used to the quads in easy terrain and only then gradually move into more demanding terrains. The customers will be driving themselves, but our personnel is with them to provide instructions and to ensure the safety of the safari. Our experienced trainers have a long experience driving in terrain. ‘Pois Tieltä!’ will plan a driving experience day together with you. You can also order dining and sauna, coffee by the campfire and grill sausages. We can also organise the required meeting facilities, accommodation and transport to the safari ground. Let’s plan together an off-road event suited to your team’s needs. Team size usually varies from four to sixty persons.